P ortrait of a Woman by a British painter was created during the 1600s. Originally thought to be Queen Elizabeth I, Roy Strong in Artists of the Tudor Court: The Portrait Rediscovered 1520-1620 (1983), points out that she is indeed not the Queen (87-88). In comparison to Queen Elizabeth who is usually portrayed in art wearing the highest style of costume with emblems of rank, our sitter has a softer nature and is not wearing anything that symbolizes power (Met Museum). In addition, Strong points out that there is evidence of the same sitter depicted in A Portrait of a Woman at Parham Park, Sussex (Fig. 1). He believes that both works were created by the same artist and depict the same sitter as both portraits feature the same aigrette pinned on the gown (Met Museum). The sleeve as Tortora and Eubank describes is known as a leg-of-mutton sleeve named after the leg of a sheep; this style of sleeve was padded at the shoulders and tapered down at the wrist. Queen Elizabeth in an 1597 portrait (Fig. 3) is also shown wearing a gown with a leg-of-mutton sleeve. 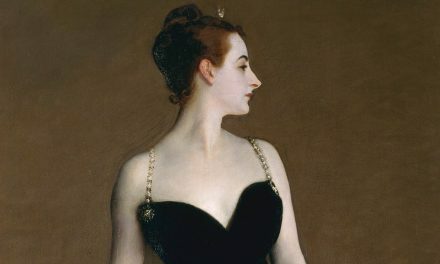 While we may not know who the woman is, she is clearly of high status due to the fashion she is shown wearing in the portrait. During this time only those with status wore pearls, Medici collars, and elaborate gowns with decorative details as everything was still being hand done and stitched. T he sitter in the portrait wears an open lace collar called a ruff which was attached to the neckline of the bodice at the shoulders and back of the neck, later this style of ruff was known as the Medici collar after Catherine de Medici. The collar is made from a form of lace called the “punto in aria” translated as ‘stitch in the air’ lace. By the end of the 16th century the ruff had become so big they had to have web-like metal frames called a supportasse to support the ruffs (Tortora 139). Also adorning her is a French conch, a sheer gauze-like veil that was also worn by Queen Elizabeth I in a portrait by an unknown painter (Fig. 4). Although it is not shown, the conch was usually cut to floor length and was worn as a cape. The conch is usually attached to a wing like structure and stood high behind the collar. Tortora states that there were references in which the conch was worn for widows however, as Elizabeth was never wed it was also more widely worn by English women (139). She is holding a feather fan, which was popular for fashion-conscious women during the late 16th to early 17th century. Fans were made from variety of shapes from semi-circle flat pieces of embroidered fabric attached to a handled frame to feathers that were affixed to a carved handle as a fan (Hill 386). Though our sitter’s feet are not shown the farthingale which supports her gown would have had shortened hems which allowed shoes to be visible for woman for the first time (Brown 98). This is shown in figure 5 in which Anne of Denmark’s shoes are visible beneath the bottom of her gown. T he leg-of-mutton sleeve has been reimagined by various designers and have appeared in multiple runways whether it on a jacket or dress. As Christina Binkley notes on the Wall Street Journal article, “The Power to Start a Trend,” Nicolas Ghesquière has shown the sleeve in various looks in his Fall 2015 runway as seen in figure 6. This sleeve has appeared in multiple runways though it has not been adopted to mainstream fashion, the sleeve is very prevalent within the fashion industry today. It was even featured in earlier runways by both Alexander McQueen Spring 2007 (Fig. 7), Dolce & Gabanna Fall 2009 (Fig. 8) which paired a short dress style with the elaborate sleeve, and Karl Lagerfeld for Chanel (Fig. 9). “British Painter | Portrait of a Woman | The Met.” Accessed November 15, 2017. https://www.metmuseum.org/art/collection/search/435779. “Designers With the Power to Launch Trends – WSJ.” Accessed November 15, 2017. https://www.wsj.com/articles/designers-who-can-start-trends-1427923371. Hill, Daniel Delis. History of World Costume and Fashion. Upper Saddle River, NJ: Pearson Prentice Hall, 2011. http://www.worldcat.org/oclc/731445106. Strong, Roy, and V.J. Murrell. Artists of the Tudor Court: The Portrait Miniature Rediscovered 1520-1620. London: Victoria & Albert Museum, 1983. http://www.worldcat.org/oclc/473930686. Tortora, Phyllis G., and Keith Eubank. A Survey of Historic Costume. New York: Fairchild Publications, 1989. http://www.worldcat.org/oclc/990635242. Yani Fong, a Fashion Business Management BS student at FIT (Class of 2018), researched and wrote this while taking HA 344: The History of Western Costume (Fall 2017), taught by Prof. Justine De Young.